There is a great tradition of serving Pumpkin Pie on Thanksgiving Day in both the United States and Canada. It all began when the European settlers first came to the New World and were introduced to the pumpkin by the American Indians. As soon as the settlers realized the pumpkin's versatility they began using it in both sweet and savory dishes. The English settlers first made a Pumpkin Pie by substituting fresh pumpkin for the thick pulp of other boiled and spiced fruits that were called for in their sweet pie recipes. Today the pumpkin pie has evolved into an open-faced single crust pie shell that is filled with a smooth custard-like filling made with pumpkin puree, eggs, cream or milk, sugar, and spices (mixture usually consisting of cinnamon, ginger, cloves, and nutmeg). It is considered a "soft" pie because it is made with an unbaked crust and uncooked filling that is baked until the crust has browned and the filling has set. After letting the pie cool to room temperature, it is usually served with a dollop of softly whipped cream. Let's start with the pie crust. My personal favorite is made with butter as I love its flavor and crumbly texture. Once made I like to sprinkle a layer of crushed ginger cookies and ground pecans over the unbaked pie crust. The advantage of doing this is twofold; it adds flavor, and it prevents the crust from becoming soggy. After pressing the nut mixture onto the unbaked pie crust, all that is left to do is to make the pumpkin filling. 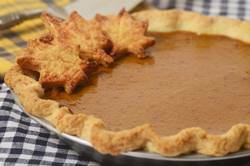 The main problem everyone has with pumpkin pies is that the filling has a tendency to crack. There are, however, a few things we can do to minimize the amount of cracking. One, do not over mix the ingredients. I find it best to mix the ingredients together by hand. Second, do not over bake the pie. Remove the pie from the oven when it is just set are the edges but the center of the pie will still look a little wet, and a knife inserted about 1 inch (2.5 cm) from the sides of the pan comes out almost clean. Now, to make our lives easier we really do not have to make our own pumpkin puree as there are excellent brands of canned pure pumpkin on the market today. Just make sure you do not buy the pumpkin which already has the spices added to it. That being said, you can make your own puree using the smaller pumpkin varieties like Sugar Pie, Baby Bear or Cheese Pumpkin (approximately 5-7 lbs., 2 1/2 - 3 1/2 kg.). To begin this process, first cut the pumpkin in half lengthwise, remove all the seeds and stringy fibers, and then place cut-side down onto a greased baking sheet. Bake at 350 degrees F (180 degrees C) for approximately 45 minutes to 1 1/4 hours (depending on size) or until easily pierced with a knife. Then scoop out the pulp and puree in a food processor until smooth. You do need to extract all the liquid, so strain the pumpkin through a cheesecloth lined strainer and then cool the puree before using. For those unfamiliar with the American Thanksgiving, it began in 1621. When the Pilgrims came to America in 1620 they encountered many difficulties. The American Indians helped the Pilgrims by teaching them how to farm and fish. In the Fall of 1621 the Pilgrims wanted to give thanks to God for all they had and decided to celebrate with a great feast. This celebration became known as Thanksgiving and is celebrated the last Thursday in November in the United States, and Canada celebrates Thanksgiving the second Monday in October. Pie Crust: In your food processor, place the flour, salt, and sugar and process until combined. Add the butter and process until the mixture resembles coarse meal (about 10 seconds). Sprinkle about 3 tablespoons of water over the flour mixture and process just until the dough holds together when pinched. (You don't want a solid ball of dough.) If necessary, add more water. After the dough has chilled sufficiently, remove from the fridge and place on a lightly floured surface. Roll the pastry into a 12 inch (30 cm) circle. (To prevent the pastry from sticking to the counter and to ensure uniform thickness, keep lifting up and turning the pastry a quarter turn as you roll (always roll from the center of the pastry outwards).) Loosely roll the pastry around your rolling pin and transfer to a 9 inch (23 cm) pie pan. Tuck the overhanging pastry under itself and use a fork, or your fingers, to make a decorative border. Cover with plastic wrap and place in the refrigerator to chill. Alternatively, you can trim the pastry to the edge of the pie pan. With the remaining pastry you can make decorative cut-outs (leaves, pumpkins, etc.). Bake in 375 degree F (190 degree C) oven until golden brown (about 10 minutes). Use to decorate the baked pumpkin pie. Pecan Ginger Layer: Toast the pecans in a 350 degree F (180 degree C) oven for about 8 minutes or until lightly browned and fragrant. Cool and then place the pecans, along with the ginger cookies, in a food processor and process until finely ground. Press this mixture evenly onto the bottom of the unbaked pie crust. Cover and return the pastry to the refrigerator while you preheat the oven. Increase the oven temperature to 375 degrees F (190 degrees C) and place the oven rack in the lower third of the oven. Place a baking sheet on the rack while preheating the oven. Place the baked pie on a wire rack to cool. Serve at room temperature with whipped cream. Store any leftovers in the refrigerator. Whipped Cream: In the bowl of your electric stand mixer, fitted with the whisk attachment (or with a hand mixer or wire whisk), whip the cream with the sugar until soft peaks form.